Any advice as to how to align all members from multiple cross-functional departments into one purpose; create an efficient, streamlined process that assures that communication, documentation and actual product flow is executed efficiently? We are specifically a design firm, but our revenue comes from the products manufactured from our exclusive designs. So, we have mature internal systems in each department, but the transitions of work flow from one department to the other sometimes break down, so there are logjams, finger-pointing and sometimes, general chaos. Much of the answer is in your question. Let me pick out your key words. Let me add three more. What you have described is the classic transition from Stratum III systems to Stratum IV system integration. It sounds like you have done an adequate job of creating multiple internal systems, that are efficient in each of your workflow disciplines. It is the integration of these systems that is giving you fits. Let me take a stab at listing some typical systems in this flow. Each of your internal systems likely works well within itself, but now you are experiencing balance problems between your internal systems. It is not sufficient to have a great design system and a great production system. If you have a weak prototyping system, your designs will get stuck on paper and never make it to production. You may have a great marketing system that creates consumer demand, but if you have a weak finished goods inventory system, your products will never find their way to distribution. Your weak systems will be doing their best and your strong systems will be finger-pointing. So, that’s the problem. What is the solution? This is a Stratum IV issue, where someone needs to have end-to-end accountability. Some companies attempt to solve this problem by creating a role called product manager. The product manager would be accountable for tracking each step, likely creating a Gant chart of product progress from one function to another. While this role gathers necessary data about the status of a single product in the chain, it still might only document that the product is stuck. That is why this is a Stratum IV issue, one of balance and integration. The S-IV manager (likely a VP) would be accountable for examining each system for capacity and handoff. This is not looking internally at the mechanics of a single system, but the interaction of each reinforcing system to each balancing system. It is not a matter of having one or two high performing functions, but having all functions able to keep up with each other, optimized for capacity. 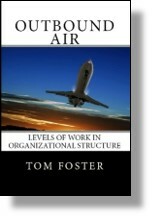 No single system manager will have the authority, nor likely the capability, to do this work. And somewhere in this integrated whole system, there will be a constraint. There will be some limitation in a single system which will drive the cadence of all the systems working together. The hat trick is identifying and placing that constraint strategically. Typically, this strategic constraint will be an expensive resource, too expensive to duplicate (which would double the capacity of that system). The identification, selection and placement of the strategic constraint, and then subordination of all other systems to the strategic constraint is the work of the S-IV manager. With this integrated system design, then the work of documentation, handoffs, communication and feedback loops begins. Most companies get this backward and have a communication seminar without balancing the systems for total throughput. You can imagine that this communication seminar makes everyone feel good, but nothing changes in throughput, the finger-pointing continues. For more reading, start with Eli Goldratt’s The Goal and Peter Senge’s Fifth Discipline. This entry was posted in Accountability, Organization Structure and tagged balancing system, reinforcing system, stratum III, Stratum IV, system integration on February 27, 2014 by Tom Foster.